SurfGuitar101.com | News: Stories with tag: "nematoads"
SURF BY SURF EAST 2015! 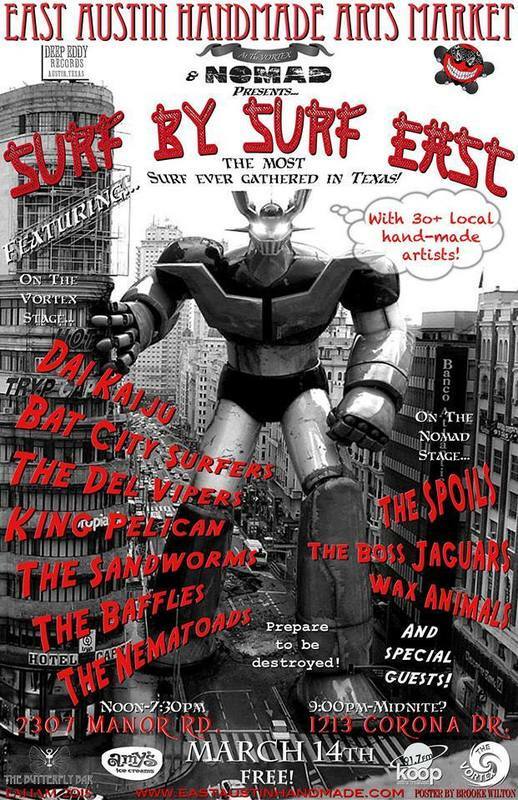 Saturday March 14th, prepare to be destroyed by the largest gathering of Surf Rock bands ever assembled in Texas! It all starts at noon. Make a splash in the back yard of The VORTEX for a celebration with over 30 local artist / entrepreneurs, as well as 10 Texas Surf Rock Bands! This is a FREE show for all ages! It's all part of the uniquely Austin relaxed outdoor shopping experience of local artisans known as The East Austin Handmade Arts Market at The Vortex, which features creations in a wide variety of mediums, all handmade and appropriate for all ages! The Butterfly Bar Austin will provide a pipeline of fine beverages all day! The first 50 people to arrive will get a gift certificate for free ice cream, redeemable at any Amy's Ice Creams location! 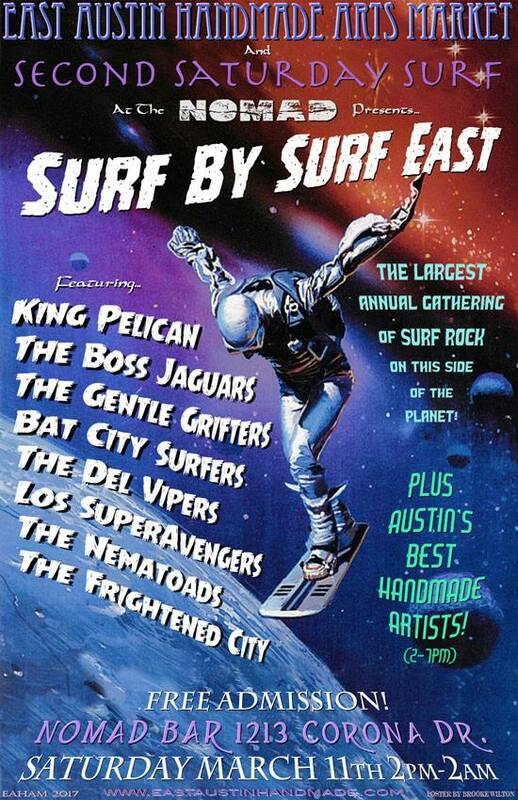 Austin's own Deep Eddy Records will also be on hand with a selection of Surftastic CDs for you to dive into! There is lots of convenient parking, it is on an easy bus route, and pets are also welcome! ...and there are special guests to be announced! This is also a FREE show, with a full bar, conveniently located East Central with plenty of parking! Several CD Releases are also taking place in conjunction with this epic event! *Not affiliated officially or unofficially. Surf and Twang with The Nematoads! We will be performing at the 1st Annual Seabrook Festival of the Arts in Seabrook, Texas. Great way to support local artists and so close to the beach! Festival activities include: Juried fine artists in every media, a kids art activity tent, live music (hint, hint), food, drink and local cuisine. We perform from 2 pm to 4 pm, so wax your boards, come on down and support local art. More information online: http://www.artshound.com/event/detail/441671717. Why: Because we're The Nematoads! Big Surf Saturday at Headhunters Club on 7/14/12; Headhunters, 720 Red River St Austin, TX, 78701. Get on your skivvies for a full 3-hours of non-stop surf music, featuring Austin's premiere surf bands The Nematoads and The Mighty Landshark! We'll start the evening with Del Vipers, and blast the waves at the end with Sally Majestic. The Nematoads are joined at the hip with the lovely surf bombshell Abra Gizelle, dancing au-go-go to our rip-tide music. $5 cover, 18+; a great line-up of top-notch surf bands you won't want to miss. For more info, visit Headhunters online: www.headhuntersclub.com. 12 am - The Mighty Landshark!